On the occasion of Wikipedia's tenth anniversary, consider the support it is giving daily to millions looking for knowledge. Wikipedia contributes to education for all in the languages in which it is provided. Check out Wikipedia Gaps and required education initiatives to address these gaps. The Khan Academy with hundreds of courses, mostly on Math and Science, yet also on History, Finance, Banking & Money, and other economics topics. Online courses from the world's top scholars: Academic Earth. Another high quality online educational resource is the Awesome Library. Even though the internet cannot be the only channel to bring learning content into schools globally, its smart use in improving educational outcomes and producing and delivering educational content can dramatically improve the cost-effectiveness of education. Is a Virtuous Value Complex Possible? 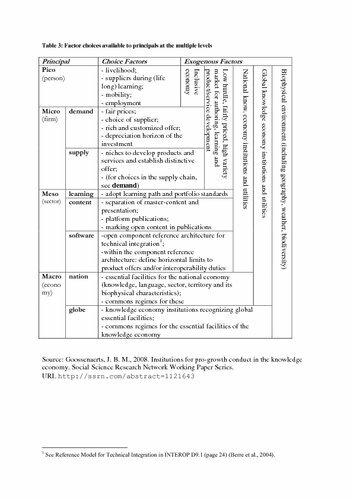 This table depicts a "blueprint" factor built-up for the members of an economy as institutions recognize the essential facilities in the knowledge economy and define commons regimes for them. These will enable the disciplining of dominant incumbents in the knowledge economy. In economic areas that are prone to lock-in, it is moreover assumed that suitable sectoral actors take charge of open architectures, open content encoding and interface standards, possible limits to offerings (within open architectures). The nesting relationships among resource endowments (right to left along the rows) determines how factor choices of the public sector (macro and meso) drive exogeneous factors for the private sector (micro and pico). A social architecture consolidates principles regarding the allocation of and access to resources. Abstract: Because ICT is becoming an ubiquitous tool in practically all the aspects that concern our society, this graduation project is focussed on finding out the requirements, among the key stakeholders of the learning society environment (the so called Educational Market), for boosting the implementation of e-learning solutions. For achieving this objective, the project addresses the transition between the traditional learning methods (AS-IS) and the innovative methods used in e-learning (TO-BE). The reasons for incorporating ICT into the educational process are: to enhance the quality of learning, to maintain a competitive advantage, and to improve the access to education. The project follows the stages of a regulative cycle and the FAST methodology. In the first part, we analyze the current situation of the key stakeholders in the three scales (institutions, organizations and persons) of the Learning Society by using repository content elements tables. In the second part, by means of Project Charters, the analyses are focussed on the desired situation that can be achieved thanks to e-learning. And finally, the third part is an evaluation phase which is aiming to find the requirements for closing the gap between the current and the desired situations. This is a multi-level case, addressing value and risk models for persons, educational establishments, publishers and country-scale institutions. Some attention is given to concertation of the regulative cycles, though this aspect must be elaborated more in future work. For a state-of-the-art example of an open learning environment: OpenLearn Learning Space at The Open University (UK). For a state-of-the-art laboratory environment for creating open educational resources: OpenLearn LabSpace at The Open University (UK). For a valuable book on Institutional Analysis and Design in the context of knowledge commons, a category to which open educational resources would belong, see Charlotte Hess & Elinor Ostrom (eds.) Understanding Knowledge as a Commons - From Theory to Practice (MIT Press, 2007). Encouragement and coordination of the efforts of the many stakeholders in the world’s diverse scientific community who are engaged in efforts to devise and implement effective means to achieve these objectives, with particular attention to developing countries. OECD study of Open Educational Resources: Forum Report (report on an Internet Discussion Forum sponsored by UNESCO International Institute for Educational Planning). A Review of the Open Educational Resources (OER) movement: Achievements, Challenges and Opportunities (a report by The William and Flora Hewlett Foundation). Kindly add relevant documents to the Education for All Scribd collection.